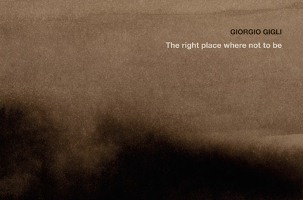 ‘The Right Place Where Not To Be’ is the debut album by Giorgio Gigli, famous for a string of dark techno releases. This album comes out on Speedy J's Electric Deluxe label Oct 23rd. This release takes a step away from the solid techno foundation Gigli works on, instead following a more conceptual route. The album carries a grainy, rough vibe throughout. The sounds of industry in nature. The opening track sets the tone for the album. A smooth and free flowing, 10 minute post-apocalyptic revelation. Using an aleatoric method on filtered synthesizers, Gigli creates a dark ambient wilderness, setting a low mood. The soft pitter patter of drum clacks is the only discernible percussive sound. Dark, ringing tones, violin bows and low murmurs of disturbance augment the tale. ‘Last Frame of Myself’ is more distressed, under more pressure and straining with effort. It is crunchier, with white noise and echoes of gurgling sounds layered over a throbbing bassline. Coarse screeches of sound course through the track, sounding like a voice speaking over a crackling radio signal. ‘Surrounded’ has a more formal off-beat rhythm, although in ¾ time. There is the same aura of unsettling unease. Percussive pots and pans sound out, alongside a wonky acid line in the middle, which bends about impressively. ‘Eve of Destruction’ has a standout melody that could have come straight from a Terminator film. Sombre strings, like the shadows of an American patriot film, speak of foreboding and calamitous deeds. ‘Nocturne’ is the strongest in terms of dancefloor utility. It has a wicked rhythm, the first note of the corresponding bassline stretches to give it a subtle bounce. The noodly bassline burbles along, imbued with hefty resonance. The album is effective and chilling material, which has been built into vibrant sonic landscapes. Deep and dark pleasure for the ears. A force majeure to be reckoned with. To be listened to in caves and atop mountains, at the extremes of the Earth. The title of the album says it all. ‘The Right Place Where Not To Be’ is possibly where the listener will not be, yet carried there by the force of the music. It is clear that Gigli has not set out solely to make dancefloor effective tracks, rather to build a story with cinematic soundscapes, each track referencing the other, with common elements throughout. A picture will say a thousand words, whereas with music there is no word limit.